As financial advisors, your day-to-day may be filled with spreadsheets, legal documents, market reports, and other paperwork. It may seem overwhelming and repetitive at times, but it’s important to remember the one thing that makes your job worth doing: client relationships. Your clients, whether you are close to them or not, trust you with their money. If not directly, then at least with advice on where they should put it or what they should do with it for the future. 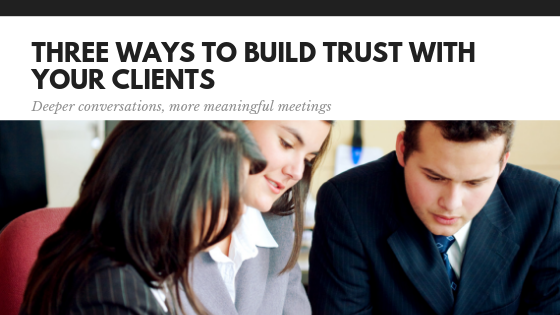 Trust is the single most important aspect of your relationship with your clients. If you have a few that are reticent to trust you or you have simply fallen behind with a little bit, here are some tips on how to establish or reestablish that trust. It’s hard to trust people that you don’t hear from. Communication is often at the forefront of relationships, whether failing or thriving. Picking up the phone and giving a call or shooting off a simple email is a great way to let your clients know that you are thinking about them, that you have their best interest in mind, and that you will be available for them when they need help. It doesn’t have to be directly related to financial planning, either. It could simply be a well-intentioned check up on life events. These are often catalysts that remind clients to talk to you about something. Try planning out a rotation for contacting your clients in some way throughout the year. Using the HALO assessment is another catalyst for starting a conversation with your clients on topics you haven’t already discussed. Though it is your job to deliver what your clients ask for, are you sure that you are doing it on their terms or that their expectations are being clearly understood? If one of your clients asks you to give them a report on how their IRA is doing, do you know when they want it, what format they want it in, or what specific information they are looking for? Ask these questions and try to hit their expectations. Once you determine what your clients expect from you, then it’s critical that you find ways to go above and beyond those expectations. Start conversations they haven’t thought about yet, provide reports and numbers that show you understand their current life situation, and be thinking ahead to what their next ask might be. If you are an independent financial advisor, you’re living comes from your clients. Products and services purchased through you are part of your livelihood. This doesn’t mean that you need to be constantly selling to them, however. You should be genuinely interested in the financial state of your clients, even if it means you won’t make money off a certain aspect of their financial planning. Likewise, try to be empathetic toward different situations, even if you have a client that might take a substantial amount of your time, try to think of finances from their perspective and the value you are adding to their life. The key takeaway is to do what’s in your clients best interest, always. This is the simplest, most straightforward tactic to building clients’ trust.